This Tropical Sunrise High Protein Breakfast Smoothie Recipe is a sponsored conversation written by me on behalf of Premier Protein . The opinions and text are all mine. Many years ago, I acquired a smoothie maker. Basically, it is a blender that has a single serve attachment to make individual smoothies. It is one of those appliances that has gained coveted counter space in my kitchen because it is used so often. My family starts the day with a smoothie almost every weekend and they are popular weekday afternoon snacks. This tropical sunrise high protein breakfast smoothie uses plenty of frozen fruit, along with Premier Protein Banana’s and Cream protein drink. Premade protein supplements are a great way to add protein to smoothies, which helps keep you full longer. 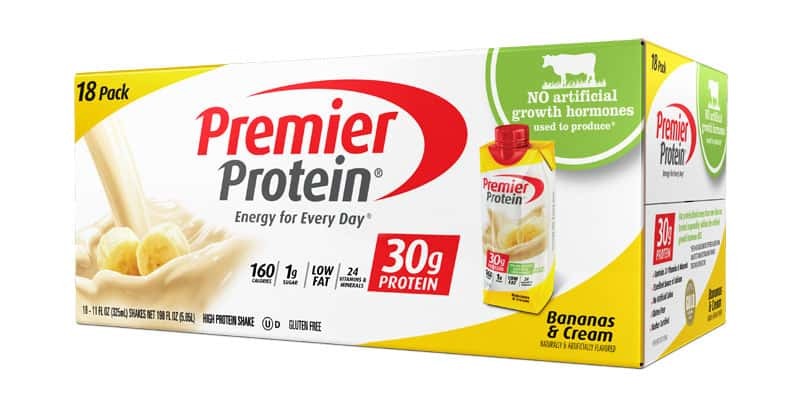 Premier Protein contains 30 grams of healthy protein and 160 calories per serving. They also have only one gram of sugar per serving and are low in fat. Premier Protein is currently having a promotion at Costco that will help save you a little bit of money. If you are a Costco member, head over and pick up an 18 pack of Chocolate, Vanilla or Bananas and Cream 30 gram shakes and you will get $5 off from now until August 17, 2017! The key to making a quick and easy breakfast smoothie recipe is to keep bags of frozen fruit in your freezer. I buy them in bulk from the grocery store and switch out the flavors, depending on my mood. You can also add fresh spinach in if you want to boost your veggie intake for the day. 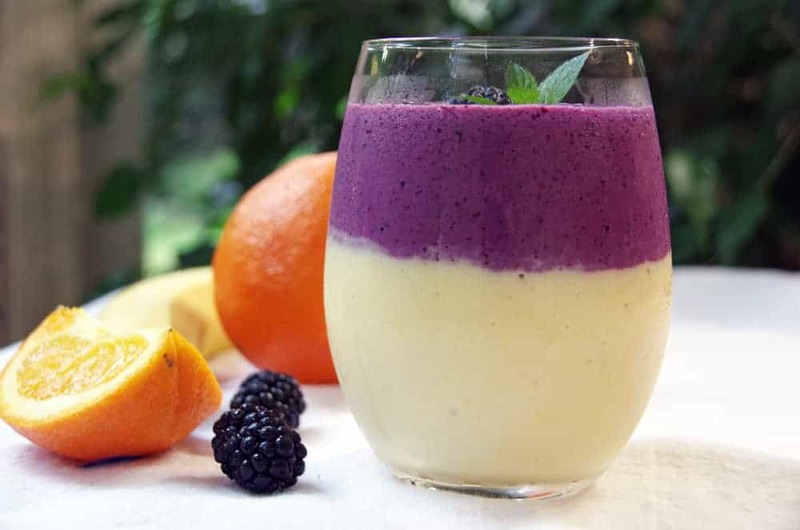 This tropical sunrise high protein breakfast smoothie recipe really looks impressive because you layer two different flavors. It is not at all complicated, though, and tastes delicious! Make sure you check out the great deal at Costco this week and pick up an 18 pack of this Bananas and Cream Premier Protein drink. 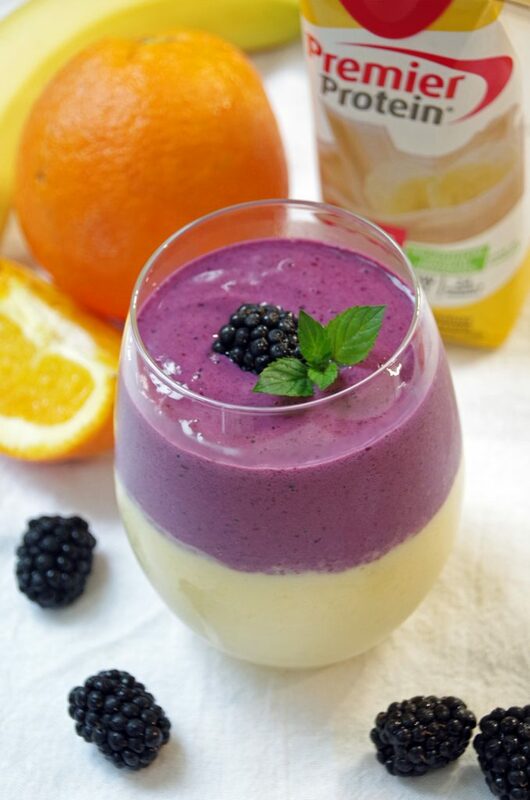 It was a delicious addition to this Tropical Sunrise High Protein Breakfast Smoothie Recipe! Learn more about Premier Protein by following them on Facebook, Twitter, or Instagram! 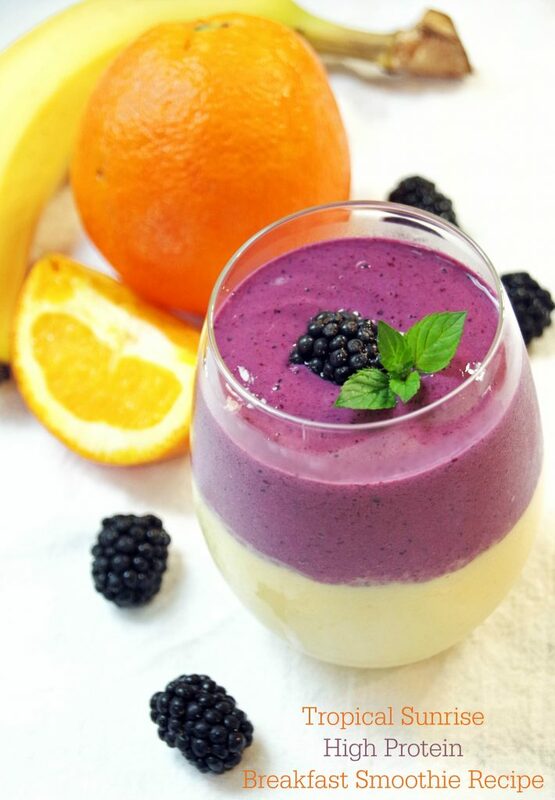 Like this Tropical Sunrise High Protein Breakfast Smoothie Recipe? what a mouth watering smootie. I need to be better about making these for the kids on school days to have them start the day right. they are definitely a delicious breakfast or an after school snack! We use Premier Protein shakes all the time at our house. I bet they would give a great protein boost in a smoothie like this. This would be perfect to make for me. I don't always eat breakfast, but this would be perfect to make when I'm on the go! In my ever-lasting quest to introduce actual nutrition to my kids, fruit smoothies have become the norm. But I've also found that downing a smoothie without protein is a great recipe for sour tummies, so I love the idea of including Premier Protein! Smoothies are great for hiding lots of nutritious foods for kids! Not only is this an ideal breakfast for me, but it's really pretty!! That looks delicious! Adding protein helps your smoothie keep you full too. I like the idea of mixing a protein drink with frozen fruit to create a smoothie. That Bananas and Cream protein shake from Costco looks delish! Oh this is pretty!! 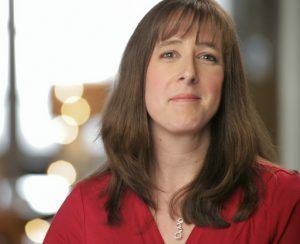 I love easy and delicious ways to get all of my protein and nutrients! Great job! That looks ridiculously good. I love how it's layered. So pretty! It did turn out very pretty!